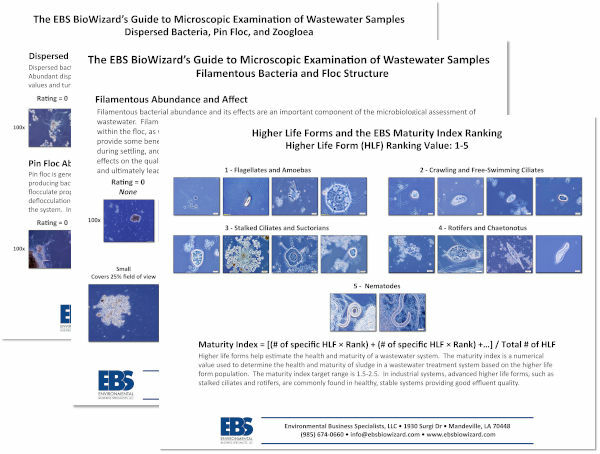 If you are new to the microscope or would like a quick reference guide, then The EBS Biowizard's Guide to Microscopic Examination of Wastewater Samples is what you need. The posters cover dispersed bacteria, pin floc, zooglea abundance, filamentous bacteria, floc structure, and maturity index ranking for higher life forms. Please submit the form to get your free copy of our Micro Examination Posters emailed to you.